Ideally, spies are people whom you would never suspect. Thus, they mix in with the background, so that we stop noticing them. Or they become so prominent that we take them for granted. Yet another strategy is to associate them with a condition that evokes fear, so that the spy-catchers do not wish to get close to them. Ben Montgomery's book "The Leper spy" is about a person who was able to become a spy because she carried the signs of leprosy on her body. This post is about Montgomery's book, as well as about another story from Italy during the second World War, where leprosy had played an important role in saving many lives. 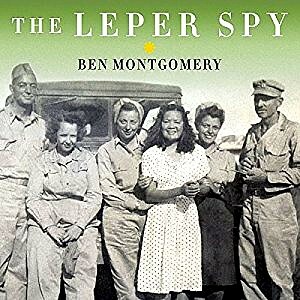 Ben Montgomery's book "The Leper Spy"
The book "The leper spy: The story of an unlikely hero of World War II" is the story of a woman called Josephine "Joey" Guerrero from Manila, who was diagnosed with leprosy, some months before Japan attacked and occupied Philippines. Joey was married to a doctor and had just delivered a daughter. Joey decided to volunteer and help the American prisoners of war and resistance-fighters in Manila. Using the fear of leprosy among the Japanese soldiers, who did not want to go near her, she could visit different parts of the city and collect information about their military structures and plans, and carry them to the Americans. After the surrender of Japanese forces and the end of the war, Joey found herself in a leprosarium outside the city, where the post-war destruction and lack of resources had a huge negative impact. Joey started writing letters to friends to ask for help. Stories of her work as a spy for the American forces helped to bring her to the US, where she could receive treatment for leprosy with the latest medicines of that time, such as Promin and Dapsone. Montgomery is an able writer, bringing together the stories of different persons involved in the Second World War in the Pacific region and in Philippines, as well as the stories about the leprosy world in Carville (USA). It is an interesting read and helps to understand the history of Philippines and the early years of development of Carville. However, while reading the book, I had an impression as if Joey was constantly hiding behind a mask. I could not get a feel about her as a person. In the first half of the book, this was because information about her is very limited. In the second half of the book, the information comes mostly from her official letters and writings. At the end of the book, for me Joey remained a shadowy figure. During the 1970s, Joey had decided to move away from the limelight, away from being hailed as a heroine and away from being an activist fighting for a better understanding about leprosy. There is little information about the last 25 years of her life, till her death in 1996. The book informs that in this period, she had studied to become a sociologist and was involved in humanitarian work in Latin America and Africa. However, if we do not look at the book primarily as Joey's life story, it is much more interesting in the way it tells us about the second World War in Philippines and the issues surrounding leprosy in the US in the post second world-war period. There is another Second World War story, where the fear of leprosy played a role in saving people's lives. This story was shared by Dr Barabino, who works in the leprosy department in the San Martino hospital of Genoa in Italy. San Martino hospital was started as a leprosy home in the 13th century. Over time, it became a general hospital and expanded. Now it is a big university hospital. During the 20th century, leprosy slowly started declining in Italy. At present, there are only 6-10 new cases of leprosy every year in Italy, and almost all of them are immigrants. This is similar to the situation in most other countries of Europe. During the second World War, Mussolini in Italy was an ally of Hitler's Germany. Though Italy had promulgated anti-Jew laws in 1938, their deportations to the concentration camps started in 1943, when the German forces entered Italy and took over the command of the war. Around 20% of the 40,000 Jewish persons living in Italy at that time were deported to the concentration camps, where almost 90% of them died. During that period an Italian ex-pilot called Massimo Teglio (left) played an important role in saving many Jewish lives in Genoa. On 2 November 1943, German soldiers attacked the office of Jewish community centre in Genoa and took away the documents with the list of names and addresses of Jews living in the city. In the following days and months, they started arresting persons and deporting them to the concentration camps. 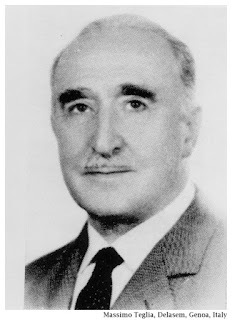 Massimo Teglio created a clandestine organisation called Delasem to save the Jews from the Nazis, to provide them with false identity papers and to help them to escape. A collaborator of Teglio called Lastrina was caught and killed. During this period, the leprosy hospital of San Martino was used as one of the hiding places for the Jews, as the soldiers of the German SS were afraid to go inside because of the fear of catching the disease. 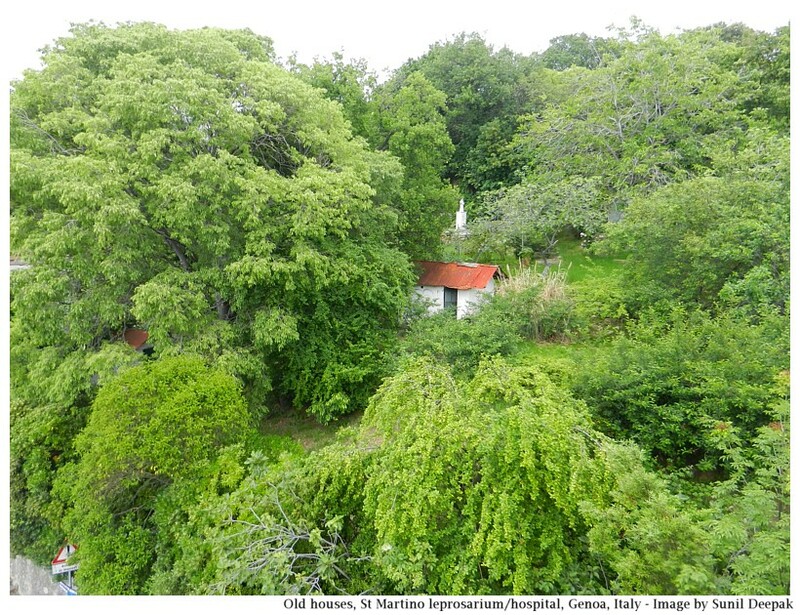 The image below shows one of the old houses used by persons affected with leprosy in San Martino hospital. The fear of leprosy is not something belonging only to the past. Today the disease is easily curable but still most persons do not know about it and continue to be afraid of it. I had another experience of this fear in 2010 in Rome, during the ceremony of conferring sainthood on Fr Damien, who had died in Kaluapapa (Hawai) while serving persons affected with leprosy. For the ceremony many representatives of persons affected with leprosy had come to Rome. Italian organisation AIFO had made arrangements for these delegates to visit the President of Italy and I was part of this group. Normally, all visitors entering the President's house need to pass through a strict security check-up. However, when we went inside, the security staff stood back and did not come near us. People who have had leprosy do not like the word "leper" as they feel that it is full of negative connotations and creates a stereotypical image of persons. They ask to not to use this word and instead say "persons affected with leprosy". However, in Ben Montgomery's book the word "leper" is used frequently and not just in its title. Through Twitter, I asked Ben regarding the use of this word in his book. He answered: "Was hoping that using the term sparingly and within proper historical context would mitigate the negative connotation. Hansen's as a descriptor is still relatively foreign, and was almost unheard of during most of the period the book covers."